Splash Sale! $150 OFF Camping Pass - 72 HOURS ONLY! Select up to 5 Thousand Trails Camping Pass Zones below. Also, get 100+ additional destinations for only $214/year with The Trails Collection. The Northwest Zone Pass entitles you to a full year of camping at all the Thousand Trails campgrounds throughout the Northwest Zone—18 in all!—located in top destinations like Puget Sound, The Oregon Coast, and British Columbia. The Southwest Zone Pass entitles you to a full year of camping at all the Thousand Trails campgrounds throughout the Southwest Zone—18 in all!—located in top destinations like The Sierra Mountains, Lake Tahoe, and Sedona. The Midwest Zone Pass entitles you to a full year of camping at all the Thousand Trails campgrounds in the Midwest Zone—8 in all!—located in top destinations like Diamond Caves and the Great Lakes. The Northeast Zone Pass entitles you to a full year of camping at all the Thousand Trails campgrounds in the Northeast Zone—14 in all!—located in top destinations like Cape Cod, Amish Country, and the Jersey Shore. The Southeast Zone Pass entitles you to a full year of camping at all the Thousand Trails campgrounds throughout the Southeast Zone—23 in all!—located in top destinations like Orlando, Chesapeake Bay, The Blue Ridge Mountains, and the Lone Star State. The Trails Collection entitles you to a full year of camping at 100+ campgrounds and resorts located in top destinations like Arizona, Lake Tahoe, Florida Keys, The Wisconsin Dells, Bar Harbor, and more. 100+ Campgrounds: 18 states including California, Washington, Illinois, New York and more! *State and local taxes may apply. If you purchase a Thousand Trails Camping Pass through our website or call center and are not satisfied with your Thousand Trails Camping Pass for any reason during the first 30 days after you sign the purchase agreement, or after you stay at a campground for not more than two consecutive nights, whichever comes first, you may cancel your purchase agreement and receive a refund. For your safety and security, our payment process requires that you enter your card’s verification number (Card Code) for Visa, Mastercard, American Express and Discover card transactions. I am over 18, and I agree to the above conditions and have read and accept the Membership Agreement, Disclosure Statement , Member Rules, and Trails Collection Disclosure. Checking here signifies that you and, if applicable, each owner of this membership acknowledge that you have been provided, have read, understood and agree to be bound by all of the terms and conditions set forth in the Membership Agreement and that you have read and understood the Disclosure Statement. By checking here you and, if applicable each owner of this membership, represent that you are at least 18 years of age. Further, by checking here you and, if applicable, each owner of this membership, are signing the Membership Agreement and the receipt for the Disclosure Statement. NOTE: We are unable to sell the Thousand Trails Camping Pass to residents of MN, MS, or SD. * Plus applicable taxes. Restrictions on use are explained in our frequently asked questions . If you purchase a single Zone Camping Pass online by April 19, 2019, you will receive a $150 discount off the regular $585 annual fee. In addition, you may choose to pay the annual fee in 12 monthly installments, provided that you commit to a two year agreement. Promotional discounts only applicable for the first year when committing to a two year agreement. 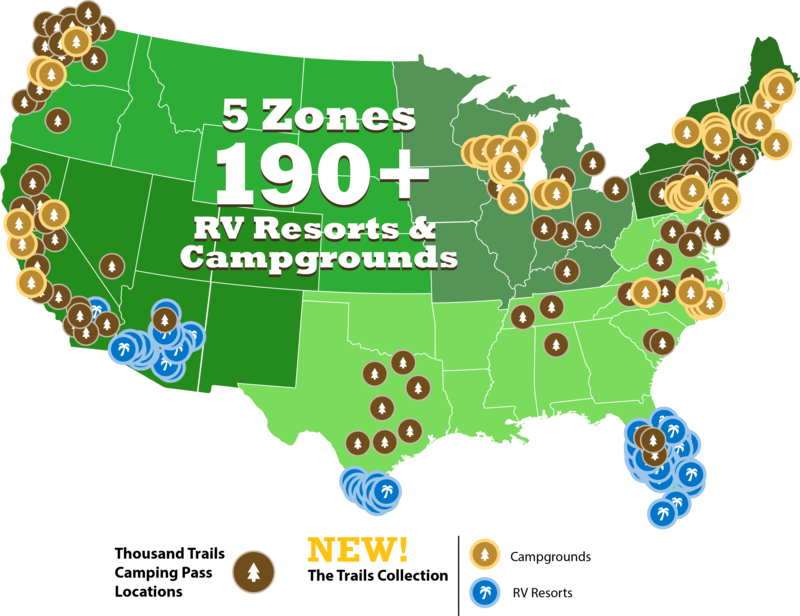 The single Zone Camping Pass includes use of all of the RV resorts in one of five zones, for one year. This offer cannot be combined with any other discounts or promotions. Offer only valid for new customers. Usage is subject to length of stay restrictions. Members and employees of MHC Property Management, L.P. and its affiliates and residents of MN, MS and SD are excluded from this promotion. This advertising is being used for the purpose of soliciting sales of resort campground memberships. This document has been filed with the Department of Licensing, State of Washington, as required by Washington law. Value, quality, or conditions stated, and performance on promises are the responsibility of the operator, not the Department. The filing does not mean that the Department has approved the merits or qualifications of any registration, advertising, or any gift, prize or item of value as part of any promotional plan. Amenities vary by property. Q: What are my Thousand Trails Camping Pass payment options? A: The annual fee of $585 is payable in full at the time of purchase or in 12 consecutive monthly installments. (see following FAQ for restrictions). While there is no enrollment fee when buying a single Thousand Trails Camping Pass, if you do purchase more than one Zone, you may finance the enrollment fee with as many as four installments. Details will be provided at check out. Q: How does the monthly payment option work for single Zone purchases? A: As a convenience, you may pay the annual fee of $585 in 12 consecutive monthly installments ($47.08, plus any applicable taxes), provided that you commit to a 2 year agreement and agree to have the monthly installments automatically charged to your credit card or withdrawn from your bank account. The first payment is due at time of purchase. All payments must be made in U.S. dollars. The monthly payment option is not available in conjunction with our discounted offers. Q: How long is the term of the Thousand Trails Camping Pass? A: The initial term of a Thousand Trails Camping Pass is (a) one (1) year if you purchase one to four zones and you elect to pay the annual fee in full at the time of purchase, (b) two (2) years if you purchase one to four zones and you elect to pay the annual fee in monthly installments, or (c) five (5) years if you purchase a National ZPP (all five zones). At the end of the initial term, your Pass will automatically renew for additional one-year periods. You may cancel your membership by notifying us at least 30 days prior to expiration. Q: What are my use privileges? A: Your Thousand Trails Camping Pass entitles you to day use and overnight camping in your recreational vehicle or tent, subject to length of stay restrictions, at all campgrounds in the zone(s) you select. During your stay you enjoy all the same amenities provided to those campers who book at the daily rate. Q: How long can I stay at a resort? A: While there is no limit to the total number of nights that you may use your Thousand Trails Camping Pass each year, we do set a maximum of 14 consecutive days for any particular stay at one of our resorts. Additionally, if your stay exceeds four consecutive nights, you must wait for seven nights before you stay again at any resort. Q: Who may use my Thousand Trails Camping Pass? A: Your Thousand Trails Camping Pass covers the purchaser, his/her spouse, and any dependent children age 23 and under who live at home or attend school away from home. Other family members may use the campgrounds as guests as set forth in the Usage Rules. Our spacious campsites can accommodate up to 10 persons, so don't forget to bring your friends along! Q: Is my Thousand Trails Camping Pass transferable? A: No, unless you purchase a National Thousand Trails Camping Pass. Once purchased, a 1-4 Thousand Trails Camping Pass can only be used by the named purchaser, and those family members listed above. A National Thousand Trails Camping Pass: (a) may be transferred to a member of your immediate family if the purchase price is paid in full and the annual fee is current at the time of transfer. The members of your immediate family are your lineal ascendants and descendants (i.e., your parents and grandparents and your children and grandchildren). In connection with any transfer of a National Thousand Trails Camping Pass, we will charge a reasonable transfer fee, which is currently $250. Q: What if I purchase the Northwest Zone but want to visit a different Zone? A: You can upgrade your Thousand Trails Camping Pass to include additional zones at any time, by calling the Thousand Trails call center at 1-877-730-5935. Q: I purchased a Northeast Thousand Trails Camping Pass previously and noticed that properties located in Illinois, Indiana, Michigan and Ohio are now in the Midwest Zone, will I still have access under my current contract? A: Yes. Under the terms of your contract you will continue to have access to those properties identified in your initial contract as long as you renew and pay your annual dues each year. Q: I purchased a Southeast Thousand Trails Camping Pass that included Diamond Caverns in Kentucky. I noticed this location is now included in the Midwest Zone do I still have access? A: Yes. Under the terms of your Southeast Zone contract you will continue to have access to Diamond Caverns as long as you renew and pay your annual dues each year. Q: What other discounts will I receive as a Thousand Trails Camping Pass member? A: All Thousand Trails members using their RVs receive discounts on stays at Encore Resorts. These discounts vary by resort. For a list of discounts please refer to the Thousand Trails website at www.ThousandTrails.com or our TrailBlazer magazine. Q: Do I receive a TrailBlazer magazine? A: Yes, your purchase of a Thousand Trails Camping Pass includes a annual subscription to our TrailBlazer magazine. Q: Does the Thousand Trails Camping Pass come with a moneyback guarantee? A: Yes. If you purchase a Zone Park Pass through our website or call center and are not satisfied with your Zone Park Pass for any reason during the first 30 days after you sign the purchase agreement, or after you stay at a campground for not more than two consecutive nights, whichever comes first, you may cancel your purchase agreement and receive a refund of your annual fee and (if applicable) enrollment fee. You must cancel your Zone Park Pass by sending a written notice of cancellation to MHC Thousand Trails Limited Partnership, 6500 Pinecrest Drive, Suite 300, Plano, Texas 75024, Attention: Contract Processing. The notice must be postmarked by midnight of the 30th day after the day on which you signed your Zone Park Pass purchase agreement or before you stay at a campground for more than two consecutive nights, whichever occurs first. Mailing by ordinary mail is adequate but certified mail return receipt requested is recommended. This guarantee does not apply to an upgrade after your initial purchase. Q: What if I have more Thousand Trails Camping Pass questions? A: Please feel free to call us at 1-877-730-5935 and we'll answer any questions you may have. Copyright © 2015 Equity LifeStyle Properties, All Rights Reserved.